Shaw Stainless carries an extensive inventory of stainless angle in multiple sizes and thicknesses. We stock a large inventory of equal leg and unequal leg, 304 and 316 stainless steel angle. We facilitate very large or small orders efficiently for quick product delivery. There are no subcategories for this product. We provide a large selection of high quality, stainless steel angle products in 304 and 316 stainless steel. Whether your project requires, equal leg or unequal leg lengths we have multiple thicknesses and widths, to facilitate your specifications quickly. Click here to view our stainless steel product offerings..
We offer and stock hundreds of stainless angle product options to our customers. Click Here. View our stainless steel resource grade chart. It lists multiple functionality and applications of different grades of stainless steel. Click Here. Our Reference Catalog is designed to identify our SS products including our stainless angle products. Specification charts and general dimensional illustrations aid in identifying products. Click Here. View our stainless steel pipe theoretical bursting pressures chart. Click Here. Stainless steel angles are available in either equal leg or unequal leg units. They are also referred to as even leg angle and uneven leg angle. Angle is generally sold in 20’ lengths. Stainless steel angle is used in structural and fabrication applications where additional strength and corrosion resistance is needed. 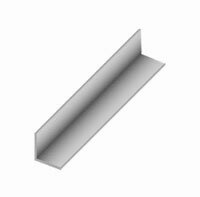 Stainless angles are manufactured from a hot rolled process. Stainless steel angle is used in many industries where extreme weather conditions or corrosive environments exist such as chemical environments, outside structures, food and beverage processing, water environments and so on.